1 of 2 Bring 4 quarts of water to a boil and lightly salt. Prepare spaghetti following package directions. Remove 1/4 cup of the cooking water and reserve; drain pasta. 2 of 2 Meanwhile, heat olive oil in a large skillet over medium heat. Add onion and cook 3 minutes, stirring occasionally. Add garlic and cook for 1 minute, stirring so garlic does not burn. Stir in tomatoes, oregano and 1/2 teaspoon salt. Cook for 2 minutes. Add wine and cook for 1 minute. 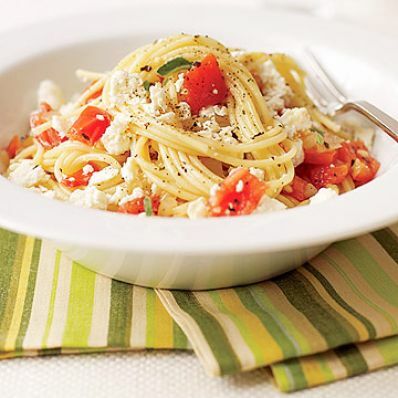 Add feta cheese, spaghetti and reserved water and toss with pepper. Serve immediately.